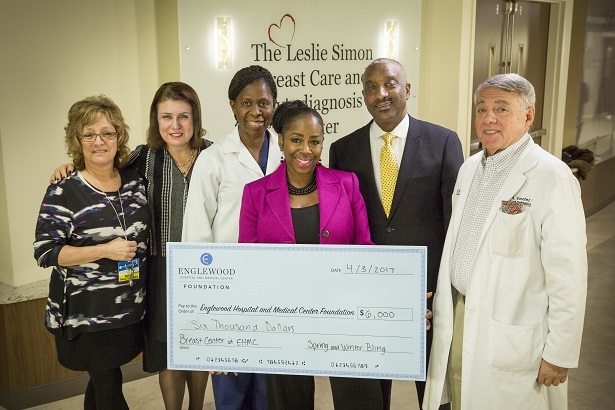 April 5, 2017 – Englewood Hospital and Medical Center Foundation received a donation to benefit The Leslie Simon Breast Care and Cytodiagnosis Center at Englewood Hospital and Medical Center from Ronald and Joanne English-Rollieson. Funds were raised through two annual events, Spring Bling Think Pink and Winter Bling. Pictured left to right: Christine Weiselberg, Administrative Director, Breast Center; Debra Albanese; Executive Vice President, EHMC Foundation; V. Merle McIntosh, MD, Section Chief of Breast Surgery, EHMC; Joanne English-Rollieson and Ron Rollieson; and Miguel Sanchez, MD, Medical Director, Breast Center.